Daniel served six active (Honorable) years in the United States Air Force. His educational accomplishments include obtaining an Audio Engineering Degree from The Radio Recording and Film connection in Los Angeles, Ca, an A.S. Degree in Management from Park University, an A.A.S. Degree in Aerospace Technology from the CCAF, a Bachelor's Degree in Business Management from Park University (Missouri). In 2011 he received his M.B.A. in International Business and Entrepreneurship, and is now nearing completion of his Flight School to become a Professional Pilot,(Truly a Life Learner that will always continue to succeed no matter what the venture or task is at hand). He definitely is a firm believer in education; it truly does open wonderful doors and opportunity, especially when combined with his experiences in the business world. Daniel is an Operation Iraqi Freedom Veteran who was blessed to make it home alive. It was these birds of peace that comforted and got him through all the difficult times in Iraq. While there, he also managed to write his business plan for United Doves and was able to take this vision and make it a reality after returning home from the war. 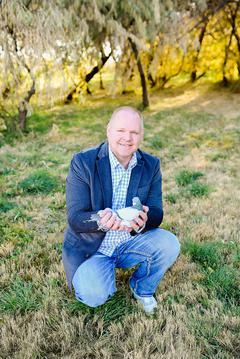 To read the story of how Daniel's White Dove Release Business began back in 1989 when he was only 12, please visit the FAQ page (near the top). We look forward to helping your business grow, and hope to be of great assistance as you become a business owner.